6 Psoriasis Of The Scalp – All you need to know!! People have a wrong impression that scalp psoriasis is another type of the skin disorder. In reality, scalp disorder is a plaque psoriasis that develops in the scalp instead of in other skin areas. The scalp is identified as one of the most common site in the body where psoriasis rashes or flares develop. Scalp psoriasis is characterized by reddish, raised, and scaly patches in the scalp. The rashes are well-defined and are going down to the neck or in some cases in the ear front. In some cases, a small area is affected (usually the upper neck or the back of head0, while is any instances, the entire scalp is covered by rash. Scales appear white and very thick with tight attachment to the hair. In severe cases, hair in the affected area gets thinner. Often, scalp psoriasis is mistaken for seborrhoea dermatitis, which is caused by a specific type of yeast. Biopsied portions of the scalp could look similar in both conditions. However, scalp psoriasis’ patches appear more defined compared to patches brought about by seborrhoea dermatitis. Of course, patients prefer seborrhoea dermatitis; which is easier to treat and is causing less discomfort, than scalp psoriasis. Several symptoms are identified with scalp psoriasis. These include: reddish plaque, silvery-white scales, flakes that appear like extraordinary dandruff, drying scalp, severe itching, and even temporary hair loss, which results from intense and frequent scratching. It is important to note that about half of all people suffering from the skin disorder are susceptible or at risk to developing scalp psoriasis. Experts believe that most psoriasis patients experience even at least a single episode of the scalp disorder during an entire flare. Diagnosis is usually taken through dermatologists’ visual examination. In some cases, biopsy should be conducted (especially to differentiate the condition from seborrhoea dermatitis). Needless to say, this kind of psoriasis is significantly affecting the quality of lived of patients. Chronic types could last for years. In some cases, scalp psoriasis flares and not other skin psoriasis areas, and vice versa. Unexpected and long-lasting flare ups are most disliked by any sufferer. Many patients even complain about the embarrassment caused by flares and their uncontrollable itching. Sleep deprivation is of course common. Is the condition treatable? There are many treatments available but not all are guaranteed to bring about favourable results. Main goals of available treatments are to control flare ups and to bring relief from symptoms. The most common available treatments are topical (applied to surface). Using topical medications could be a bit challenging because the treatments should be applied directly to the scalp and not the hair. In this regard, application could take time and could test anyone’s patience. Phototherapy is applied if topical treatments fail. This is done through the use of laser or special light sources. Specifically, excimer laser is identified as most effective in treating scalp psoriasis. If scalp psoriasis is most unwanted, there is a light of good news. No matter how severe psoriasis flares could get, scalp psoriasis does not last as long as other flares. Dermatologists remind sufferers that with their assistance and proper application of prescribed treatment, the condition could be easily and quickly curtailed in just a matter of hours of days. Scalp psoriasis can be mild with slight scaling. It can also be very severe with thick plaques covering the entire scalp and can cause hair loss. Embarrassing flakes can be visible especially after scratching the scalp. Scalp psoriasis is characterized by inflammation, redness and scaling along the hairline and the skin behind the ears. When cells in outer skin layers reproduce quicker than normal, scaling can result. When this scaling occurs, scales pile up on the surface of the skin. One common scalp psoriasis remedy or treatment is Coal Tar shampoo. At least half of the people who suffer from Psoriasis have it on their scalp. As with other forms of Psoriasis, skin cells grow too quickly on the scalp. Although for some, the scalp is the only affected area, scalp psoriasis can extend beyond the hairline onto the forehead, around the ears and the back of the neck. Quite often, people with psoriasis of the scalp have psoriasis on other parts of their body as well. If you are like most scalp psoriasis sufferers you’ve been searching for scalp psoriasis remedy by visiting doctors and specialist. You’ve tried all sorts of sprays, shampoos, creams and applications like Dermovate Scalp, Coal Tar, Polytar and other scalp psoriasis treatment. You have likely been told that there is no cure. But you can certainly control your condition and enjoy a better life. Researchers believe that psoriasis is an immune system disorder producing extra T or white blood cells in the skin. These cells trigger inflammation of skin and excessive skin cells which leads to the inflammation and flaking of skin. Scalp psoriasis treatment depends on how serious the disease is. Treatments affect different people in different ways. Trial and error are the only way a doctor can find what works for a particular patient. Psoriasis shampoos are oftentimes helpful in controlling scalp psoriasis. Some patients respond positively to certain ointments, coal tar or medicine with vitamin B3. Some people respond quite well with Dermovate for psoriasis of the scalp. This is applied to the scalp after shampoo with Coal Tar and this helps control the condition. Methotrexate is also quite effective for some people with psoriasis of the scalp but this oral administration has to be monitored by doctor as it can cause liver problem in some people. Scientists and researchers are searching for genes that may contribute to the cause of psoriasis. They are trying to figure out what occurs in the body to trigger the condition. So you can expect more promising scalp psoriasis remedy in the future. Youthful, healthy-looking skin is the result of proper care. Being diligent about skin care now will make your skin healthier and more attractive in years to come. If you neglect or abandon your skin care routine, you may be at risk for developing unsightly or unhealthy skin conditions. Your lips are extremely sensitive. It is a good idea to use balms and salves regularly. Regular lip balms will ensure your lips stay moisturized and soft, while a balm with an SPF factor will also protect them from sun exposure. To enjoy healthy skin, control your levels of stress. Uncontrolled stress can lead to sensitive skin which ultimately results in skin problems. If you take measures to handle your stress, it will promote healthier skin.TIP! After a visit to the gym, make sure to shower so as to eliminate sweat. Just wiping won’t rid your skin of pore clogging bacteria. Consuming watercress can do wonders for your skin. They can reduce pore size, inflammation and any puffiness on the face. It’s easy to add healthful watercress to your meals, and it has many benefits for your health and your skin. Not only will it be a positive for your skin, it is loaded with iron and antioxidants that keep you healthy. If you’re in the market for a good soothing mask, consider trying out a honey mask. Glowing skin is a proven result of applying honey, causing a bright appearance and lessening redness. A honey mask used once a week will also help reduce acne. Try using lotions that do not have fragrance and that are hypoallergenic. One ingredient that is quite prevalent in commercial creams and lotions is alcohol, which is very drying for the skin. Before you buy any product that will be put on your skin, read what is in it. Avoid products that contain fragrances, dyes or alcohol.TIP! If you want your skin to be healthier, warm up your lotion before you put it on. Warm moisturizer is absorbed by your skin faster and more effectively. Warm moisturizer works better than cold. When your moisturizer is warm you will notice that your skin absorbs it better, which makes it more effective. You can warm it by placing a small amount in the microwave for a few short seconds. Or, you might place moisturizer into a container of warm water as a way to heat it up. Sunscreen is best applied with makeup sponges. A sponge provides a more even application of the product. Using a sponge helps the sunscreen work to protect your skin better, and it will stop your hands from getting messy. Protect your skin and refrain from using tanning booths. People often tan to look younger, yet the long term results of frequent tanning will make you look older. Tanning beds are especially harmful to your skin and causes premature aging. If youthful skin is what you seek, don’t bother looking for it at the beach or in a tanning bed. Baking soda works wonders not only in the kitchen, but on your skin, as well. Baking soda mixed with water forms a substance that can be used to moisturize dry skin or to draw out dirt and bacteria from pores. It also can be utilized in removing hair spray from your scalp.TIP! Use a makeup sponge to evenly apply sunscreen. Doing so will allow you to avoid touching the sunscreen and will enable you to spread it on your skin evenly. It is important to remember that your skin is just as important as the other organs in your body. To improve skin texture and avoid problems, do your best to eat well and supply your body with healthy food and water. You will find this also helps with digestion, a function that correlates to skin quality. Increasing your fibre intake is a great way to boost your digestive function. If your stomach is happy, your skin will be as well. A simple but important step to maintaining your skin is to wear sunscreen every day. The sun is one of the most damaging threats to skin. Using sunscreen beneath foundation can prevent a lot of sun damage. SPF protecting foundation is also a helpful form of sun protection. Keep stress at bay for skin and body health. When you experience stress, your blood levels of adrenaline, DHEA and cortisol all rise. These hormones can cause many health problems as well as skin problems such as psoriasis, eczema and acne. Your skin is a signal to the world that reflects your inner health, so a peaceful mind will help lead to healthy skin. These tips can help you combat eczema. First of all, don’t use any products with added fragrance. Wear clothing that is made of cotton. Wool and synthetic fabrics sometimes cause a bad reaction with eczema. Also, be sure to use dye-free, natural cosmetics. By using these tips, your skin will be less likely to get irritated.TIP! You need to eat right to have nice skin. If you would like clear skin, make sure you provide your body with all the nutrition it needs. Lowering sugar intake can prevent premature aging in skin. The sugar causes an increase in glucose, which sticks to protein cells. The protein in your body functions in the cartilage, ligaments, and collagen in skin. Consuming too much sugar will cause the skin to wrinkle and sag. Use razors carefully when shaving. The razor blades are sharp and can irritate or even damage your skin. Lubricate your skin using shaving cream, lotion or gel to give it some protection. Also, make sure your razor is clean as this will provide the ideal shave. As you shave, go with the lay of the hair, instead of against it. By following the tips above, you can have great skin and alleviate your worries about dangers like skin cancer. Take the time to care for your body and it will return the favour. If you have oily skin, select a foundation that is oil-free or even a mineral powder. These foundations are specifically designed to absorb any oil from your skin. People with oily skin should avoid liquid foundation. Scalp Psoriasis, though quite rare than the most prevalent form, Plaque Psoriasis, is a distinctive form of Psoriasis, which often affects the scalp and any of the surrounding skin regions. Scalp Psoriasis varies extensively from patient to patient, and while some have the mild scalp psoriasis with thin scales and quite unnoticeable scales, some patients have severe scalp psoriasis, which often appears on the scalp, the back of the neck, the skin around the ears and even the forehead. Not only is severe scalp Psoriasis exceedingly itchy and highly visible, but it’s quite a challenging Psoriasis to treat. Often at times, your dermatologist will prescribe topical treatments such as creams, oils, shampoos, gels, foams and lotions, following a scalp Psoriasis diagnosis. These topical treatments seem to work incredibly with most scalp Psoriasis patient, but utilizing and removing these products from the scalp and your hair can be daunting, and sometimes, frustrating. Pre-treat- Prior to application of any scalp medication, it’s exceedingly vital to apply some prescribed scale softening oil or agent. Pre-treating helps in scale removal, making your Psoriasis medication more effective. Move your hair out of the way– It’s crucial to section your hair when applying any scalp medication, at least to ensure that your hair doesn’t get in the way. You should part your hair, making absolutely sure you expose your scalp before administering any medication. Apply the 5 minutes rule– When applying the prescribed scalp Psoriasis medication, particularly topical treatment; you must leave one medication for five minutes before applying the next. If you are intensely worried about the scalp medication smell in your hair, then you can rinse your hair thoroughly with some hair shampoo, just ensure this shampoo doesn’t touch your scalp. Avoid mint- Mint can be a notorious scalp lesion irritant, especially when they are somewhat open and raw. Consequently, you ought to aver using shampoos or topical treatments that contain mint. As a matter of fact, it’s best to avoid any topical treatments with additives, except ones with tea tree oil, which is quite a good Psoriasis alleviator. Be gentle- Avoid rubbing, scratching or even scrubbing your scalp when applying topical treatment because this might aggravate your scalp Psoriasis. Go easy on steroids- Topical steroids are indeed wonderful scalp Psoriasis treatments, but too much steroids exacerbate scalp Psoriasis. Using topical steroids on the scalp 3 to 4 times weekly is encouraged, but don’t overdo it. Use conditioner- A dry scalp is often a huge cause of scalp Psoriasis flare ups, because it encourages itching. Experts recommend frequent use of scalp Psoriasis alleviating conditioners, which will help ease the itching and discomfort. Cover your ears- Your ears are readily susceptible to irritation by these scalp topical treatments, so when applying your scalp medication, apply little petroleum jelly on two cotton balls and put them on your ears. Don’t blow it- Always let your hair dry naturally because your blow dryer with exacerbate your scalp Psoriasis. If you must, then utilize the lowest setting. Be patient- It’s quite unrealistic to expect your prescribed scalp medication to work in days, because most scalp Psoriasis treatments can take up to eight weeks to take effect. Moreover, you must continue with the prescribed scalp Psoriasis medication even when your scalp gets clear. Use of medicated shampoo or tar twice a week will be ideal. Hide the evidence- When you have scalp Psoriasis flare ups, wear light coloured clothing to draw away attention from the scalp flakes. Bright-coloured clothing helps hide the flaring plaques. Scalp Psoriasis can be an exceedingly frustrating skin disease to deal with, and as such, frequent dialogues with your dermatologist will help a great deal. A recent Psoriasis research has shown that patients with severe scalp Psoriasis rapidly improves when topical treatments were used hand in hand with high powered Ultraviolet laser light therapy. Be utterly cautious, talk frequently with your dermatologist, and your scalp Psoriasis will get better in no time! Here I will list the active ingredients used in the most common anti-dandruff shampoos and explain what they do. Make sure you read the labels when shopping for a particular ingredient since the same brand often produces similar products with different ingredients. Always follow the instructions on the labels. Zinc pyrithione, or Zinc omadine is an anti-fungal and antibacterial agent that is most commonly used to fight the dandruff caused by yeasts and fungi. Once you begin using this treatment, stopping will often cause dandruff to return worse than before treatment began. Ketoconazole is an anti-fungal drug used to treat dandruff caused by yeasts and fungi. Dandruff usually returns after treatment is stopped. Selenium sulfide is an anti-fungal agent used to treat dandruff caused by yeasts and fungi. In the US, 1% solutions can be purchased over-the-counter and 2.5% solutions are available by prescription. Dandruff often returns when treatment is stopped. Coal tar is a liquid by-product of the distillation of coal. It is used in shampoos meant to treat head lice and psoriasis. Be warned, coal tar is on the NIOSH carcinogen list as a potential cancer-causing agent. Salicylic acid based shampoos are used to help the scalp shed excess skin more easily, which in turn helps to keep skin pores from getting clogged. There are tons of home brew dandruff cures out there, every family likely knows of a different one that they will swear by to cure dandruff. Here I’ll list some of the most commonly recommended concoctions. Tea tree oil has an anti-fungal quality and can be mixed into lotions, oils and shampoos. Massage the mixture into the scalp and let it sit for 15 minutes prior to rinsing clean. Aveda has a product named “Scalp Remedy” that is growing in popularity. It contains both coneflower and red clover extracts, comes with a dropper and is applied directly to the scalp after you shower. Scalp massages with moisturizing oils an hour or so before bathing are said to rejuvenate a dry scalp. Skin lotions will likely work as well. Some people have reported success after rinsing their hair with white or apple cider vinegar prior to bathing. It may have something to do with correcting your hair’s PH balance. Psoriasis Of The Scalp – All you need to know!! Psoriasis of the scalp can be an extremely discomforting, not to mention embarrassing condition to be victim to. It causes your scalp and some adjacent skin to develop red patches of dry, scaly skin, which may or may not shed like dandruff. Clearly, scalp psoriasis is not an ailment you can really ignore or put off for treatment later. You need to tackle this health problem at the earliest, so as to minimize uneasiness and dispel the self-consciousness it usually causes. The first step towards coping with psoriasis of the scalp would require you to equip yourself with adequate information about the same. So here’s all that you need to know about scalp psoriasis, if you or your loved one is suffering from it. Psoriasis is an autoimmune disease, which basically means that it’s caused by your immune system working overtime. It is characterized by a red skin formation, often capped with silvery crust that may occur at different sites on the body. Other than the scalp, psoriasis may affect skin on the hands, knees, feet, elbows, lower back and face too. Though the exact causality of psoriasis is not too well understood, experts maintain that a variety of triggers could cause certain blood cells to multiply too quickly and deposit themselves on the skin, thus causing the rash. It is assumed that genetics could play a role in predisposing people to psoriasis for those with a family history are more likely to contract it. However, it is a non-contagious disease and so cannot be transmitted from one person to another. Unfortunately, there is no cure for psoriasis; there are only ways and means to control its symptoms but flare-ups can recur at any time. The rash-like skin aberrations appear on the scalp though their severity and visibility varies from person to person. In some cases, the patches may be barely noticeable, and in others, completely hard to miss. The rash may extend onto the forehead, neck and area behind the ears. In more severe cases, the red patches are likely to be thick and swollen, clearly distinguishable from other skin. Silvery-white scales: Many a times, the skin rash is covered in silvery-white scales which are dry and flaky. When the dry, silvery scales flake and fall their appearance is very similar to that of regular dandruff. People thus tend to confuse scalp psoriasis with just poor scalp health which is not the case. Thus, if scalp skin begins to flake, it should not be taken too lightly. Sometimes, psoriasis can cause skin to get so dry that it cracks and begins to bleed. A bleeding scalp is however a very extreme condition and ideally, treatment should be sought much before this situation arises. When the scalp skin is irritated and inflamed, a rather sharp burning sensation may be felt. In addition, the scalp may feel itchy and scratching it may enhance the pain. Hair loss: For some people, scratching the head due to psoriasis may cause hair loss. Fortunately though, once the psoriasis heals, hair tends to grow back normally, unless the hair follicles have been damaged by the excessive rough handling. If any of these aforementioned sensations occur, consult a physician or dermatologist without the slightest hesitation. The faster you begin treatment, the quicker your scalp psoriasis will heal. When you consult a medical practitioner for psoriasis of the scalp, there are a number of recuperative measures he could suggest. Usually, an assessment of the severity of the condition guides the physician to prescribe any particular course of action. You may be asked to switch your bath products. Medicinal shampoos, oils, soaps, lotions, potions and creams may be prescribed, the combination of which may provide relief from the various symptoms. Most of these shall contain salicylic acid and/or coal tar and may or may not be available without prescription. In some cases of mild scalp psoriasis, the doctor may inject low-potency steroids right into the affected area. Alternately, if these don’t work, laser or non-laser light-based treatment may be administered. When psoriasis of the scalp is quite severe, doctors may prescribe strong drugs for oral consumptions such as corticosteroids, Vitamin A derivatives or Vitamin D variants. Most of these high-potency drugs have many side effects as well and thus require much observation and review by the doctor. While these are the treatment options available, there are other supplementary lifestyle modifications that can help provide relief from the condition and prevent recurrent flare ups. To master the art of keeping scalp psoriasis at bay, you will then have to resort to the following measures. Shampoo your hair gently and remove the scales carefully. Consider using a scale softener. Change your hairstyle to mask most of the affected area if possible. Wear lighter shades in clothes to prevent flaking from being too prominent and visible. If scalp psoriasis is causing you too much stress and self-consciousness, visit a psychologist or join a psoriasis self-help group. This is highly recommended. Avoid alcohol for it opens up the skin’s blood vessels allowing more heavy deposits of the malignant skin cells. Stay away from gluten-rich foods for they are known to exacerbate inflammation. Condiments and dairy products are also known to worsen the symptoms for they have an inflammatory effect. Consume anti-inflammatory foods such as fatty fish, dark leafy greens, ginger, and turmeric and so on. The point is that scalp psoriasis, being an incurable condition, requires patients to make concerted efforts in preventing flare-ups. Thus, changes in lifestyle, diet, self-care and hygiene are an absolute must. There are some people, who mistake a breakout of thick flakes on their scalps as a dandruff problem, and they will sometimes try to treat this with the use of normal, everyday dandruff solutions like shampoos, conditioners, creams and other such items that are used to help get rid of these white flakes. 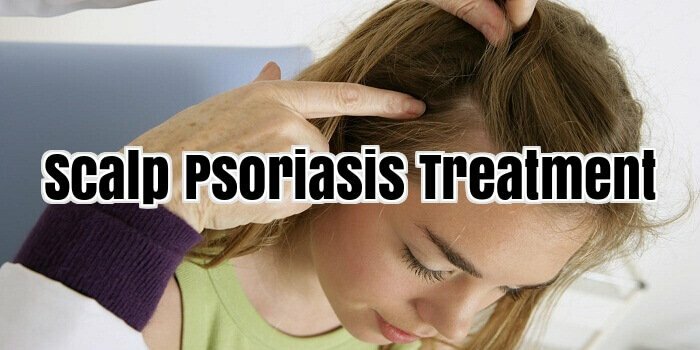 What they do not know is that the dandruff they are treating may not be actually dandruff but rather scalp psoriasis. Scalp psoriasis is a kind of skin ailment that manifests itself in symptoms like red patches on your scalp that is often covered or accompanied by white or silvery flakes, skin or scalp that may bleed due to dryness and cracking, and a burning or itching feeling. On the other hand, dandruff is a skin problem that bears some similarities to scalp psoriasis, but to a lesser extent. Dandruff can also be called seborrheic dermatitis or seborrheic eczema, depending on how severe the case may be. Symptoms of dandruff or seborrheic eczema may also include the usual flaking of the skin, itchiness and sometimes yellowish scales that are found near the hair shaft. While it may seem like these two are rather different, and they do have certain notable differences, they can actually be treated with the same treatments, depending on the severity of the person’s scalp psoriasis or the dandruff problem. The most notable difference between the two problems is probably the thickness of the scales that the skin condition produces. Scalp psoriasis tends to produce thicker scales than dandruff. This means that while they can both be treated with the usual dandruff shampoos that contain ketoconazole or selenium sulphide, sufferers of scalp psoriasis may need to use more than just shampoos to help keep the scaling, the skin cracking and bleeding down. Another distinct difference between dandruff and scalp psoriasis is the fact that while a person suffering from dandruff may have an itchy scalp that has a layer of flakes on it, a person with scalp psoriasis will often have more than just his scalp to worry about since this condition usually has other manifestations on the person’s body in the form of psoriasis scales. These can usually be found on a person’s elbows, fingers and even on his knees, and they may require treatments with the use of ointments or creams that are formulated for such problems. Diagnosing whether a person is suffering from seborrhoea eczema or from psoriasis can be done with a little scrutiny of the other parts of the person’s body for other flaky regions. Should these be absent, the person need not worry too much since there are treatments that are pretty effective on any of these two scalp problems.